In the 1980s, NASA realized LED lights could help grow plants in space. At the Kennedy Space Center’s Space Life Sciences Laboratory in Florida, radishes flourish in a plant growth chamber. They’ve never seen the sun. 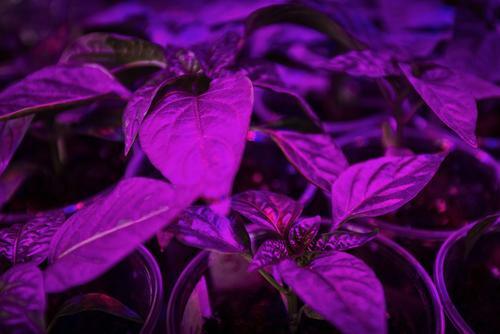 Instead, they grow under red and blue LED grow lights — the same technology that could eventually help astronauts grow plants in space. For terrestrial gardeners, LED grow lights can spell the difference between a successful indoor garden and a space-age flop. Here’s what you need to know about the best LED grow light technology — and how it can help your indoor plants flourish. Your indoor plants need intense and abundant light to grow frequently. A grow light setup in your indoor garden is the only way your plants will thrive — even when the sun isn’t shining. But despite modern successes with indoor plants, LED lights had a rocky start. When NASA started using them in experiments, blue LEDs weren’t anywhere near as powerful as they are now, so plants were leggy and bleached. But with new advances in lighting technology, it’s clear why LED grow lights have been embraced by rocket scientists and indoor gardeners alike: they’re capable of outperforming fluorescent lights and surpassing HID lamps in efficiency, cost, and yield. LEDs target specific wavelengths of light needed for photosynthesis and cut out any excess light. You gain complete control of the light that hits your plants, which means that you can optimize the photosynthesis process of your plants from the seedling to the flowering stage. It’s crazy — but it works. “Even subtle changes in light quality can potentially increase antioxidant properties of crops such as the lettuce used here,” Mickens said. The advances in the indoor growing techniques allow you to maintain your own growing season year-round, which means that you’ll always have a supply of fresh, homegrown, organic vegetables, herbs, and flowers. With your indoor garden, you can even accelerate your seedlings before planting them outside. The market now has a huge number of grow lights with different specifications. These grow lights range from incandescent lamps to huge, sophisticated setups of HID and LED lights. Incandescent light bulbs are inefficient for indoor growing. A cost of the bulb is minimal, but you will need several of them running for most of the day just to grow a single plant. You can keep a small plant growing and alive with incandescent lamp, but you will need to mitigate the heat and absorb the costly electrical bill. Fluorescent grow lights offer a great deal of electrical savings compared to the incandescent bulbs. Although they are a good choice for indoor growing, the drawback is that they must be very close to the plants to have any effect. These lights work well when growing plants and herbs that don’t need much light, but fluorescents do not have the intensity to properly grow and flower complex, fruiting plants and vegetables. Fluorescent lights are also not environmentally friendly due to the mercury vapor contained inside of them. Metal Halide: This light is great for keeping the plants compact in blue-white light, but you can only use metal halide as a primary light source. A metal halide bulbs lasts for two to three grows before it needs to be replaced. Metal halide bulbs are a great source for lumens: they produce up to 125 lumens per watt. High Pressure Sodium: High pressure sodium light is red-orange in color. This light is suitable for flowering plants. The cost of high pressure sodium is economical because of its durability: it’s twice as durable as metal halide. But a major drawback is that it generates an immense amount of heat — the tip of the bulb can heat up to several thousand degrees. These light bulbs also use up a great deal of power, so you will notice an increase of about $100 to $150 per month for each one used for a typical grow cycle of 16 hours per day. From aquaponics to space missions, indoor grow light technology is impressive, promising, and a part of our future. What are your thoughts about this tech? Let us know in the comments. Contributed by Ted San. If you want to write for Green Future, check out our submission guidelines here. "LEDs have shown outstanding results in yielding natural, healthy, and strong plants. "